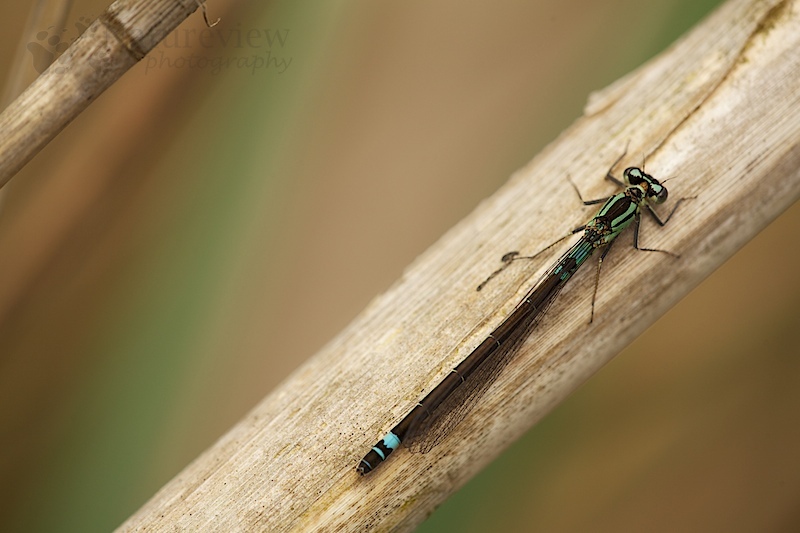 As said in the previous post, I’m working backward now… The other target species of Saturdays excursion, besides the Lilypad Whiteface, was the Dark Bluet. For me this was the fourth excursion to the Weerribben to find this species. There is only one population of Dark Bluets in the Netherlands, with anywhere between 1000 and 3000 individuals. This population was only (re)discovered in 1999, after the species was thought to be extinct since 1956. Dark Bluets like shallow water with dense vegetation (e.g. sedges). As these vegetation types are really vulnerable, this place is normally not freely accessible. But with this excursion we get permission to walk on the drier parts between the water (thanks SBB!!). As the population is fairly large, finding the species is easy, once you’re at the right place. Taking pictures however is harder. It’s not easy to find a willing individual in a nice setting. This is one of the reasons why I joined this excursion for the fourth time… My hopes weren’t that high this time. I was quite sure we would find the Dark Bluets (which indeed we did), but taking pictures with the strong wind was something different. However in the lee of some reed I found two individuals that were nicely posing. In the end I made some of the best pictures of this species in four years. So another reason why I was happy with the outcome of the excursion.